Use our resources to better understand this ongoing environmental catastrophe. The Aral Sea was once the world’s fourth-largest lake. 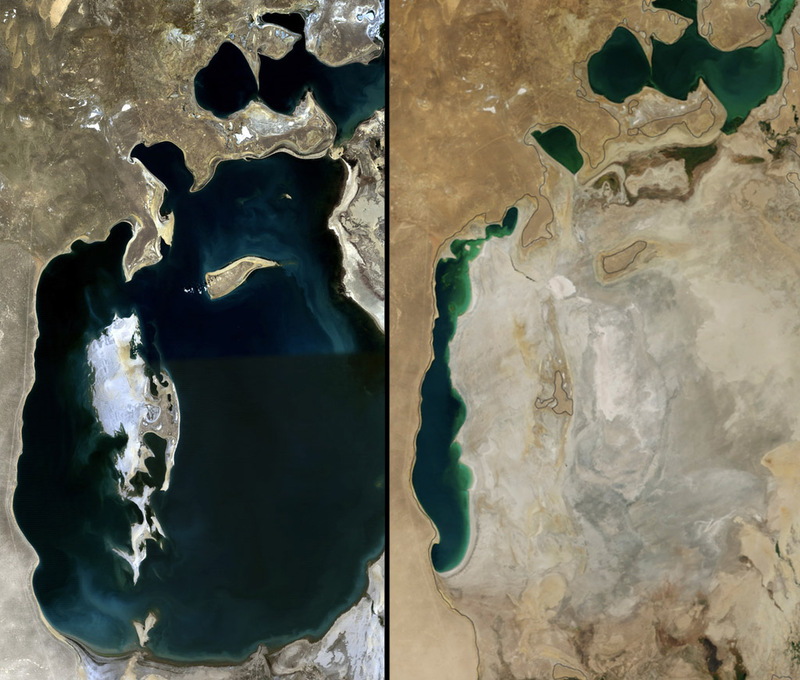 According to our media spotlight “Disappearing Lake,” the Aral Sea has always been a saline (salty) lake, but it has become much saltier as its waters have receded. Why? Are there other examples of this phenomenon? Water evaporates, salt doesn’t. As water evaporates into the atmosphere, heavy minerals such as salts are left on the ground (creating salt flats) or in the remaining water. In the Aral Sea, this process has been augmented by human activity—incoming water has been prevented from actually reaching the sea, leaving literally tons of salt. As a result, the remaining water is saltier. This phenomenon is very common. It happens as saline lakes form in endorheic basins. Endorheic basins, such as the Aral Sea, don’t drain to a stream, lake, or ocean. The water that flows into these types of basins evaporates or seeps into the ground. Read more about endorheic basins here. The largest salt flats in the world, in the highlands of Bolivia, developed as the Andes Mountains formed and saltwater lakes evaporated, cut off from both their sources and drainage outlets. Only the salt remained. The most famous example of a salty lake that is only getting saltier is the Dead Sea, between Israel and Jordan. The Dead Sea is one of the saltiest natural bodies of water on Earth. Water flowing to the Aral Sea was diverted to irrigate crops in Kazakhstan and Uzbekistan. So why are some fertilized, agricultural areas actually suffering as a result of the diversion? Read through our media spotlight “Disappearing Lake” for some help. Have other bodies of water been “dried up” due to human impact? Check out this Nat Geo photo gallery of eight rivers that are running dry from overuse. Take a look at Lake Chad, a vital freshwater source for Nigeria, Niger, Chad, and Cameroon. Lake Chad, an endorheic basin like the Aral Sea and Dead Sea, has shrunk drastically in the last 50 years. Can we do anything to preserve the Aral Sea? Aral sea was considered among the Wold’s biggest lakes, then how come between 14-15 years it dried completely, and what has the salt to do in that, I am still confused, it looks like there is some other reason behind this. Its really shocking.